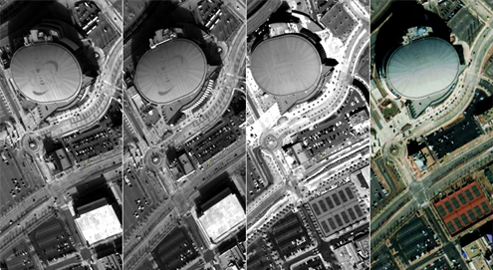 From left to right: WorldView-1 stereo pair in NCDRD format and QuickBird Basic Image, courtesy of DigitalGlobe™; IKONOS pan-sharpened RPC image, courtesy of GeoEye®. SOCET SET® v5.6.0 digital mapping software is used for precision photogrammetry and geospatial analysis, and is renowned for its unequaled depth, performance, and ability to ingest data from numerous image sources. SOCET SET also exploits film, digital airborne, satellite, and terrestrial imagery. The software can combine different sources within one project, giving the user maximum flexibility to meet mapping goals. In addition, users can batch-process operations to increase productivity, including distributed processing on networked computers using the Condor® application. The base software includes: frame and close-range image import; multi-image viewing; real-time image shaping and rectification; and automatic interior orientation. Additionally, the “Core” bundle includes Model Setup, Image Map, Line of Sight Analysis, CIB® Import, CADRG, OpenFlight™, and Simple Sensor Models. Additional functionality, such as triangulation, DTM generation, orthorectification, and feature collection, is available in optional modules. The user purchases only what is needed. Feature collection and editing in the ESRI® environment. Since SOCET for ArcGIS utilizes the rigorous photogrammetry of SOCET SET in conjunction with ESRI’s ArcMap application, operators can follow their ordinary GIS workflows in a familiar environment while collecting accurate geospatial data in stereo. Click here for SOCET SET v5.x system requirements.